"I wager I can break your heart in six weeks! Lady Francesca Cecilia Epping angrily tossed the gauntlet at Brixton Smythe-Medway's feet. The handsome, insolent rogue left the lady little choice after he wagered with friends that he wouldn't marry until he was fifty -- and would never wed "mousy Fanny Epping." Though she has secretly adored Brix for years, Fanny means to make him pay dearly for his indiscretion -- with one blistering kiss. Where on earth did Fanny learn to kiss like that?" One moment of intense, unexpected pleasure is forcing Brix to view his childhood friend with new eyes. When did she transform into this spirited and shockingly sensual beauty? But the ton is watching closely, and Brix's pride insists that he not lose his own bet...or Fanny's. So he will not feel jealous when he sees her on another's arm. And he will fight this sudden, irrepressible desire to kiss her again...and again. 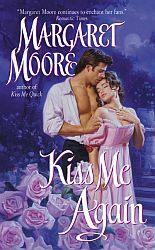 "A not-to-be-missed Regency with just the right sensual spark, Kiss Me Again has humor to spare and an agreeably daring heroine." "